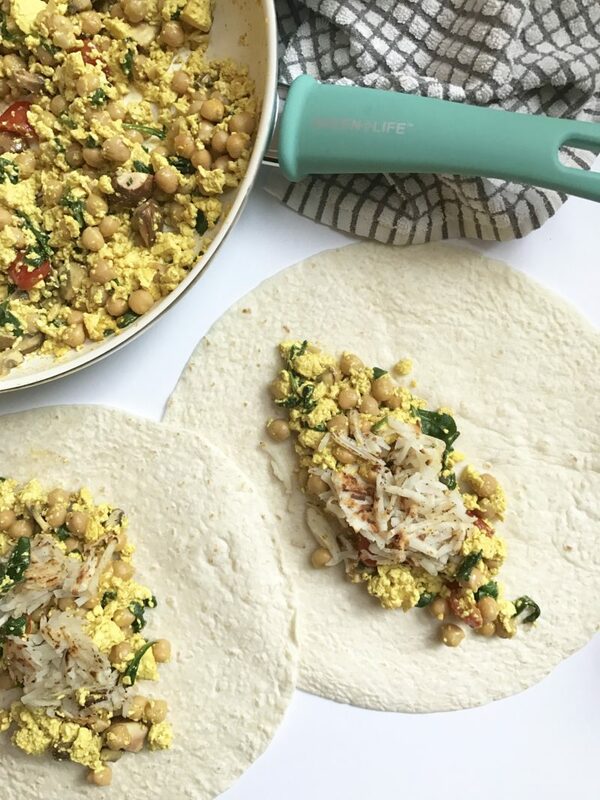 Who doesn’t love breakfast wraps? They’re so delicious and easy to make. I thought it would be fun to come up with a meal prep freezer safe version that you can make on a Sunday and have throughout the week! These wraps are packed with protein and veggies and have a delicious crunch from shredded hash browns. 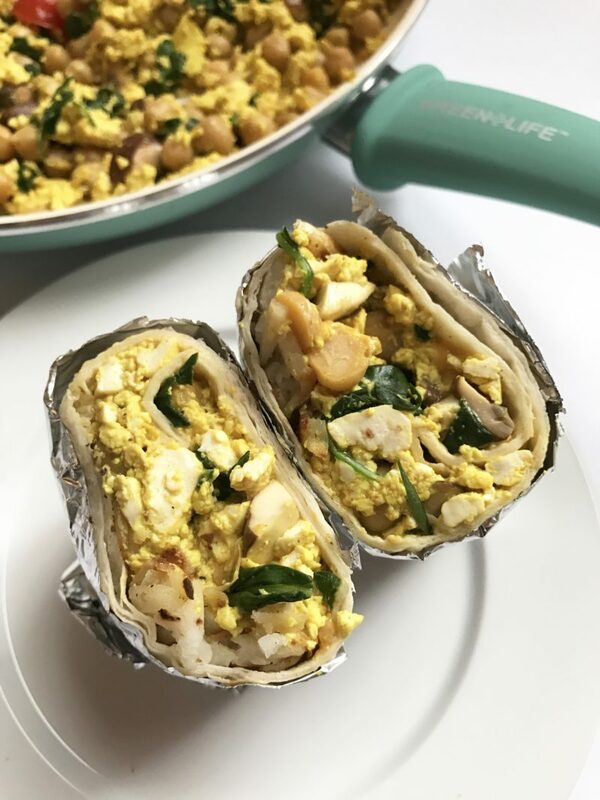 I’ve paired up with GreenLife Cookware for this recipe because of their amazing ceramic non-stick products. This allows for your burritos to just need a quick spray of your favorite oil and stick to the pure plant ingredients in this recipe. 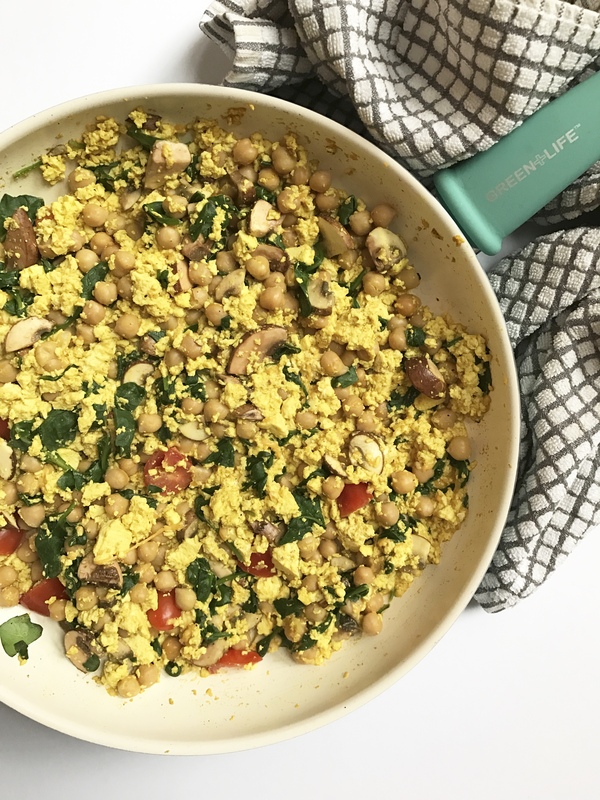 I cannot tell you how many times my tofu scramble will stick to a pan. Even with oil or Vegan butter, I still lose some of my scramble because of remnants that have burned on the pan. The thing I love about the frypan from GreenLife is that it is ceramic non-stick coating which means not only will you lose any of your ingredients but also it makes for an easy clean up & is also dishwasher safe (which is perfect for a lazy person like me). What I love about this recipe is the surprise with the chickpeas. I think chickpeas are an added bonus in any meal and these wraps are no exception. They add just the right amount of texture and flavor and really balance out with the tofu and veggies in the recipe. I’ve never been big on meal prep from the simple reason that I don’t like leftovers. However, when it’s frozen and in a wrap then I have absolutely no problem. These are really great for college students on the go (like me), those who want to bring something to work, or just when you’re lazy one morning and don’t feel like cooking. All you have to do is take it out of the freezer and pop in the microwave or the oven. Simple ingredients and simple cooking. My favorite combination. I was inspired by the average frozen breakfast burrito you can buy in the freezer aisle. However, most of them are definitely not Vegan. Making your own is not only cheaper but way more delicious because you can completely personalize it to your needs and preferences. For instance I just like to keep my veggies simple with mushrooms, spinach & tomato. I also love tofu scramble and eat it frequently. My favorite secret addition is Vegan cheddar cheese! It completely changes the texture and makes it more “eggy” like. What I especially love about GreenLife is that it’s oven safe! When you’re ready to crack open a burrito one morning just stick it in your green pan with just a smidge of oil and let cook for 15 minutes in the oven at 350 degrees Fahrenheit. The handle will stay cool which means it’s easy to handle. I hope you enjoy this recipe. Remember, if you make any of my recipes don’t forget to tag me @plantbasedjane so I can see! First, cook your shredded hash brows. Cook directly on GreenLife pan and add some salt & pepper. Cook until crispy. No added oil needed! Set aside. Directly on the same pan, crumble your tofu (do not press it) and add your spices. Cook for 3-4 minutes or until your tofu is coated with the turmeric. After 4 minutes, add your veggies and chickpeas. Cook for 2-3 minutes or until the spinach has completely wilted. Add in your Vegan cheese and mix through to evenly distribute. Remove from heat and scoop some of the filling and hash browns into your tortilla. Fold and cover with tin foil. Repeat for all your burritos. Store in freezer. When ready to enjoy a burrito, bake in oven on your GreenLife pan for 15 minutes at 350 degrees Fahrenheit or pop in microwave. 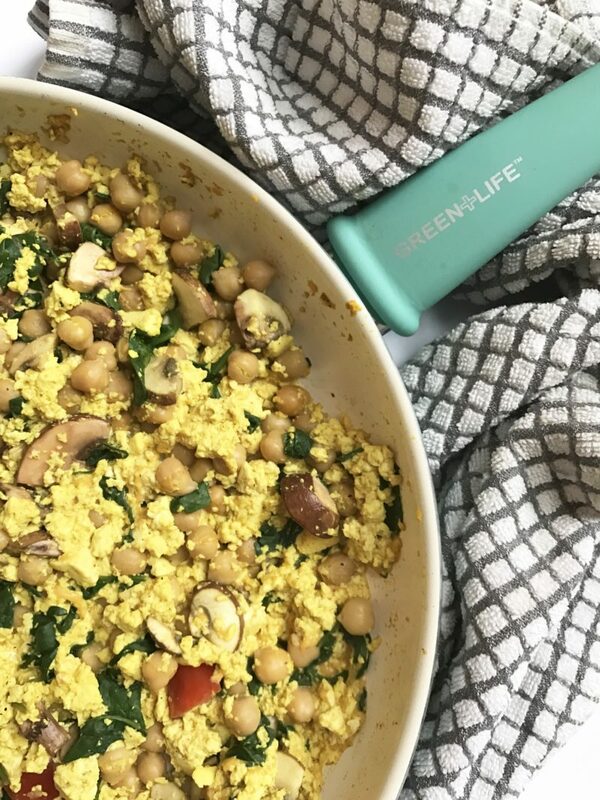 Thank you so much for GreenLife Cookware for sponsoring this post. I only work with brands I truly love and resonate with and GreenLife is one of them.